The British decimal ten pence (10p) coin – often pronounced ten pee – is a unit of currency equalling ten one-hundredths of a pound sterling. Its obverse has featured the profile of Queen Elizabeth II since the coin’s introduction in 1968, replacing the two shilling coin in preparation for decimalisation in 1971. Three different portraits of the Queen have been used on the coin, with the latest design by Ian Rank-Broadley being introduced in 1998. The second and current reverse, featuring a segment of the Royal Shield, was introduced in 2008. The ten pence coin was originally minted from cupro-nickel (75% Cu, 25% Ni), but since 2012 it has been minted in nickel-plated steel due to the increasing price of metal. 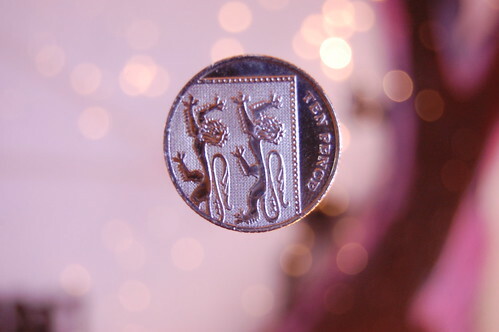 From January 2013 the Royal Mint began a programme to gradually remove the previous cupro-nickel coins from circulation with replacement by the nickel-plated steel versions. This will have the side effect of leaving only one circulating reverse and obverse combination (see design section below). As of March 2013 there were an estimated 1,598 million 10p coins in circulation with an estimated face value of £159.797 million.